I had occasion to come across something I was seeing when the SoP blog closed, the feminist man-up rant to the men that don’t know their proper place with the excuse that men need to do it to save Western Civilization. In “Does Marriage Keep Society Afloat?”, we have the very correct observation made by Derek Ramsey that birth rates are going down and that it’s going to effect the economy. However, his conclusion leads us right into another typical feminist man-up rant: The men just aren’t playing along because they aren’t marrying and having children. To borrow the only line I ever quoted from Davis Aurini on my blog, Ramsey is seeing the appearance of the problem and not the essence of it. The essence of the problem is feminism, which created the economic conditions (among other things) that were pointed out. >Look at Japan, it’s there for everyone to see. Their decline is here, but they are just the first in line. Let’s look at Japan further. There’s a movement there with men called “grass-eaters” or “herbivore men” who have rejected traditional marriage because of the feminist overtones. The men were expected to be “Salary Man”, working as much as possible. Then as the facets of traditional marriage go, they were expected to present their pay checks to the wife for use and live off of whatever she deemed fit to give him not unlike how marriage works in Western Civilization. It is well known in marketing circles that women control the purse strings and contribute to a vast super-majority of all the spending in the economy. Simply put, in Japan as here, feminism created incentives against marriage and family. >The only way out of this, without significant side effects, is to support marriage and increase family sizes. Now here is where Ramsey really goes in the rough with his arguments. 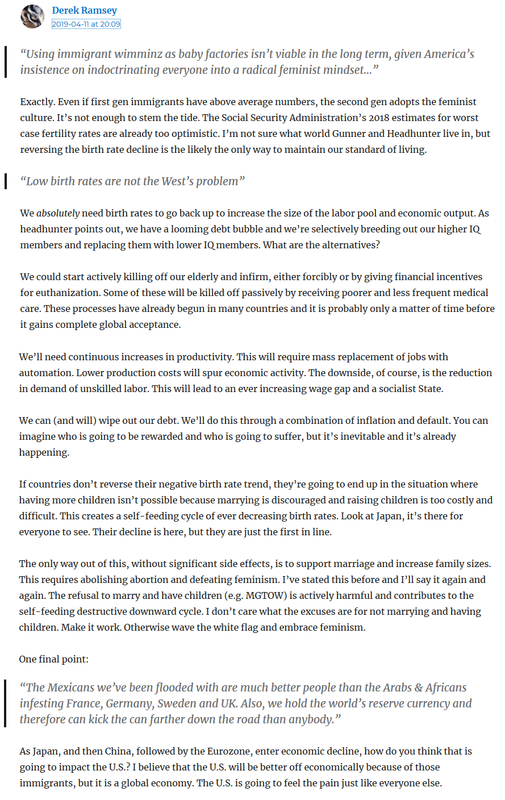 >This requires abolishing abortion and defeating feminism. The only agreeable thing he wrote. The existence of abortion is a condition created by feminism, so the only requirement is defeating feminism. >The refusal to marry and have children (e.g. MGTOW) is actively harmful and contributes to the self-feeding destructive downward cycle. This is wholly incorrect. Either Ramsey has a incorrect perception of feminism, or is a traditional feminist apologist (don’t know which). >I don’t care what the excuses are for not marrying and having children. Make it work. Otherwise wave the white flag and embrace feminism. In other words, Ramsey wants men to embrace feminism by getting married and having children. Therein lies the problem as Ramsey sees it – the weak men just aren’t playing along to make feminism work. Traditional marriage represents the locus of control of feminism, and to that end marriage is poisonous to men. They see all the evils of marriage as represented through the divorce courts, alimony, child support, and the like. They see the expectations upon them to serve their wives and be walking ATMs, to absolutely no benefit to men. Then they see the cramped job market and the increasing cost of living, and realize marrying will only increase that to the point of making it unsustainable. Then they see the poor moral quality of the women available, which has made them un-marriagable. Larger numbers of men have figured this out and are avoiding it and more will continue to so. They all definitely see the only function of marriage in this day is to bring men under the control of women, impoverishing men and enriching women in the process. The answer to the problem Ramsey rightfully points out is to defeat feminism, making it a disgusting way of thought. Unfortunately, feminism is so ill-defined in the minds of most that opposing “feminism” ultimately does no good because they don’t define the problem well nor have the will to do what it takes to solve it. All manning up and marrying the thots will do is perpetuate the problem. Most MGTOW will recognize that it will take massive societal pain to break the control that women have gained in this society via marriage and other means. If one looks through history (reading “The Fate of Empires” by Glubb will be very educational), they will find that there are cycles of empires and certain characteristics of those. The USA is at the end of its cycle as well as Western Civilization and will experience some pain in the end to “correct” things, as there’s no political will towards true morality. Often, there will be those like Ramsey that want to reverse the state of things instead of correct them – rather rebuild feminism instead of eliminating it. This is as many men, who chafe before the consequences of their actions and will seek to remove them, but will not seek true repentance before the Lord. Repent and correct the conditions that make marriage poisonous to the point that feminism is a “never again” entity and you will get increased marriage and child birth within two or three generations. As long as women are in control as they have been the last 400-500 years things will stay the same as they have always been, and there will be the typical societal downfall that comes with judgment before the Lord. After all, a society that has systematically cannibalized half of its members will inevitably fall, and more importantly deserves to fall. Nature always seeks equilibrium. You’ve misunderstood what I wrote. This is understandable. I’ll formulate a response when I can. This is an excellent piece. I’m glad that you’re blogging more frequently. Brother Derek has had the luxury of having married a decent woman early in life. From this perspective, his viewpoints are pretty solid. The problem is that the vast majority of men (and women) can’t enjoy the same luxuries as Ramsey (and his wife), and we know this is because of the bastage of feminism. This is taking it a bit far. I didn’t interpret Ramsey’s essay as directly urging men to embrace feminism, but only to make us aware of how feminism has destroyed society, and what needs to happen for a reversal to take place. But you have argued that a reversal is the same as a return to the past, and that what is necessary is a “crash and burn” with a new Phoenix rising. This argument does have some merit, and is probably what will have to happen. “Traditional marriage represents the locus of control of feminism, and to that end marriage is poisonous to men. They see all the evils of marriage as represented through the divorce courts, alimony, child support, and the like. They see the expectations upon them to serve their wives and be walking ATMs, to absolutely no benefit to men. What you have described is not what I would call “traditional marriage”, but rather, modern-day marriage in Western feminized cultures. I also disagree that marriage is the stronghold of feminism. Instead, I think the departure from traditional Christian values, especially the widespread acceptance of sexual liberation, is the stronghold of feminism. If people would once again seek the glory of the Lord, and sexual norms would be drastically tightened up, then women would once again view men and marriage in a much different light. A lot of this is a simple section bias – because this was the way for him, then it should work the same way for everyone else. A lot of it is simpleness, which the average traditional feminist man has to have in spades in order to accept the rule of the woman he is married to. Nevermind, there is always a sword of Damocles above the head of any man that chooses to marry that will fall once the wife tires of her slave. Remember, whether a marriage is together or not doesn’t make it healthy – inevitably the woman always “wears the pants”, with the man following after saying “Yes dear, whatever you want honey.” with the visions of “Happy wife, happy life.” in his head. I have witnessed this in person with every marriage I’ve seen, and just about every marriage depicted in blogs or elsewhere. But you have argued that a reversal is the same as a return to the past, and that what is necessary is a “crash and burn” with a new Phoenix rising. This argument does have some merit, and is probably what will have to happen. Actually what I’m arguing is that a return to the past is a support of feminism. A lot of traditionalists will harken back to the 50’s when it comes to families, but they were just as feminist back then as marriage today (I posted a Donald Duck cartoon once to prove that out). In other words, if men would just stop being such babies, marry the women, and stop screwing them over, everything would be fixed. To that end, Ramsey sounded no different than the usual suspects making the man-up rants. Such a view presupposes the moral superiority of women over men, making the whole argument feminist. One misdefinition of feminism confines it to the bra burners of the 60’s, but it in fact goes back farther. Proof of that can be gained in studying Phyllis Schlafly and her opposition to the Equal Rights Amendment – she opposed it because she and many other traditionalists realized that men had far more cause to sue under an ERA than women ever did and it would have eliminated the overabundance of rights that women have enjoyed. It would have killed traditional marriage (and feminism along with it). Ultimately, what we have today is a competition between two competing views of feminism regarding how to properly handle men – nothing to do with true feminist opposition. What you have described is not what I would call “traditional marriage”, but rather, modern-day marriage in Western feminized cultures. I also disagree that marriage is the stronghold of feminism. Think about it. If I want to remove the risk of alimony, child support, and so on, what can I do? Not marry. That said, marriage represents a tool of great control over men, in fact a principal and only control back in the traditionalist times. Before the modern feminists, men ruled in the world and the women ruled the men. Ultimately, men had it no better at any point – marriage has always been a raw deal. Remember there’s been such things as Men’s Rights movements for over 100 years (a post coming for that), and things such as John Knox’s “The First Blast of the Trumpet Against the Monstruous Regiment of Women”, as published in 1558. The reason for this is because marriage is an absolute requirement so that men may be placed under the control of women. Sadly, this is a very common attitude in churches today – I and other men like me don’t find any acceptance simply because we aren’t married. Marriage is never a thing a man is supposed to undertake with wisdom in the feminist economy. Instead, I think the departure from traditional Christian values, especially the widespread acceptance of sexual liberation, is the stronghold of feminism. Think about when this “departure from traditional Christian values” happened. Clue: Long before the 1960’s. Ultimately, the only difference between modern and traditional feminism is that women gave up the chaste angelic facade that traditional feminism required of them. Instead of needing to stay home so as to not be spoiled by the sin of the world, they started going out to work. Instead of keeping to the chaste virginal image required of them of marriage by the traditional deal of the SMV, they sought to lower their price by the vestiges of sexual liberation.